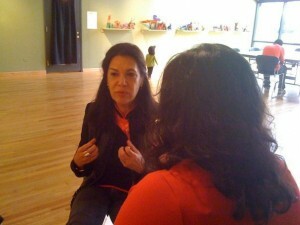 Yolanda Cardenas interviews Ana Castillo for Proyecto Latina. Proyecto Latina seeks writers, reporters, bloggers, citizen journalists and you to spotlight an issue(s) impacting Latinas in Chicago or nationally. We know you will provide a unique perspective in reporting these stories and if you have an opinion on something we want to hear your point-of-view. How to pitch a story? Never done this? Relax it is an easy process. Write us an email explaining your idea. Find one or two writing samples to share with us. This can be an article you’ve written, a link to a blog post, or a piece that’s yet to be published, or maybe that letter you once wrote and never sent. In a brief 300-word bio tell us who you are and include your complete contact information. Email these items to info@proyectolatina.org by August 1, 2011 at 5 p.m.
Focus: issues impacting Latinas locally or nationally. We are open to the following genres: Blogs, interviews, profiles, traditional news reporting pieces, literary journalism, how-to, photo essays. What do we mean by “issues”? A recent and very informal poll of our Proyecto Latina attendees at our third Monday reading series revealed interest in some of the following topics: Latina teen pregnancy rate, housing, youth, economy and mental health. Maybe you have another topic that you are not seeing reflected in the media. So what if you like my pitch? We are going to let you know by phone or email. We may want to discuss your idea and invite you to submit an assignment. An assignments means you get a deadline, you should be open to talking work-in-progress with an editor, and most importantly you will be paid for your work. If we see eye-to-eye we can move into the second phase. Who said that pitching was just for baseball players? We will be giddy that you took a chance and shared your story ideas with us but to move forward with us you must be available for an initial face-to-face meeting and agree to connect with us via email to give us an update on the status of your article. Deadlines will be set at the initial meeting with editor(s). Before our first date, we will remind you of our vision of the completed project with you. The ideal length and/or format of your written piece would be approximately 1,700-2,000 word series–don’t let the word count scare you–it would be posted in 3 posts at about 600 words each on an approved theme. Photo Essays should include 15 to 20 photos with captions and a written introduction summary of 50 words. We are also going to need photo of you. Payment will issued once article is completed and posted. We believe the following will not only strengthen the credibility of your story but will also make worthwhile reading to our audience. Site statistics or studies, for example U.S. Census and other reports that have come out within the last two years that reflect the Latin@ community. 2 to 3 photos/relevant images to include in the post. Be ready for edits upon review by editor. Please note there is a possibility that your post will get reposted by the Community Media Workshop, and Community News Matter Initiative outlets. Remember: Email pitches to info@proyectolatina.org by August 1, 2011 at 5 p.m. This project is supported by the Local Reporting Awards, The Chicago Community Trust , Community News Matter initiative.